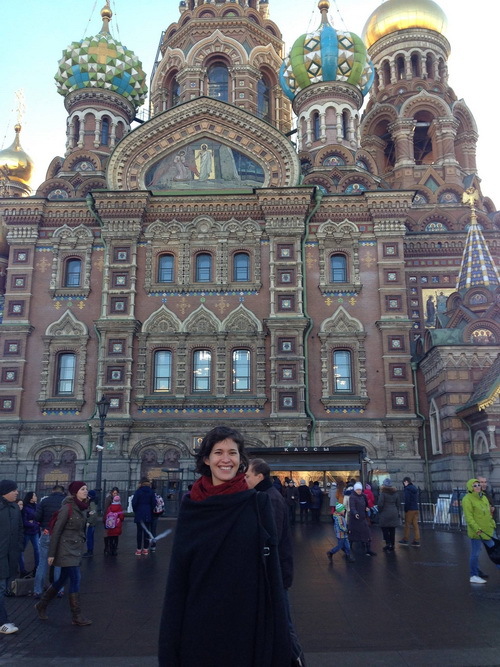 Esther Blokbergen: I love Saint Petersburg! You are here : Home > Posts > Interviews > I love, love, love this city! I love, love, love this city! Esther Blokbergen, 28, from Netherlands is a student and intern at Liden & Denz (Intercultural institute of languages) in St. Petersburg. She traveled much across the globe before landing for some time in St. Petersburg to answer our questions and tell us that the city is even friendlier than Amsterdam. What do you do in Saint Petersburg? I came to St. Petersburg for an MA program, but it didn’t really work out… So now I’m studying at Liden & Denz and interning as a web editorial assistant in the afternoons. What are your impressions of the city in general? How could St. Petersburg be compared to other cities you’ve been to? I love, love, love this city. It is big enough for there always to be something to do, at any time, but also small enough to not be overwhelming, and, after some time here, you meet people you know on the street, which is a wonderful feeling. The weather is, well… not the best, but I lived in Amsterdam before this, so I came prepared. And, compared to Amsterdam, St. Petersburg is a lot more friendly overall. What could you say about tourist services in St. Petersburg? Is there enough information available in the city or not, I mean is it easy to orientate oneself? Were people, you contacted to, kind enough to help you? I didn’t really “do the tourist thing” so I wouldn’t know about information booths or anything like that, but the street signs all have Latin transliterations and there are a few people around who speak English, especially young ones. Even if they don’t, they will go out of your way to help you, and that’s simply amazing! Transport is extremely convenient, especially the metro. The buses work just fine too, as long as it isn’t rush hour. Using the elektrichka can be overwhelming at first but, again, if you ask anyone for help, they will explain where you need to go. Which advices could you give to English-speaking people who would like to travel to St. Petersburg? Learn some basic Russian! Most people are eager to communicate with foreigners but not many speak English, some because they simply don’t, some because they’re very shy. Meet them half-way with a few Russian words and you are sure to find some common ground! Is St. Petersburg cheap or expensive to live here for a long time? St. Petersburg is definitely cheaper than Amsterdam or most Italian cities, especially as far as basic necessities are concerned. However, rents in the center are not all that cheap, and restaurants and bars can be quite a drain on your budget, too. I find, however, that at the end of the month I have always significantly more money left over than I would have guessed. Some foreigners got used to meal they eat at home, and it’s rather difficult for them to find food they want here. Do you have any problems with food here? How did you like traditional Russian dishes? I have made myself a promise to avoid the classic, super-cheap stolovayas, after a few bad experiences at my university and around it. There are a few stolovaya-type joints which are quite alright, though – I can do Frikadel’ki, for instance. I absolutely love Russian home-cooked food, even when it is covered in mayonnaise (which, unfortunately, I also love a lot). At first I was a bit traumatized about not finding certain products which used to be essential to my cooking repertoire, but then, well… I just changed my repertoire, and I’m eating just fine. I was super happy to find many Korean restaurants here, which I go to when I’m in need of comfort food. Also there’s a growing burger culture which I am happy to see more and more of. The White Nights are just wonderful. I love coming out of a bar or a club at 5 AM into broad daylight, and in the past few weeks the mornings have been incredibly sunny and warm. It can be a problem to sleep, since most places don’t set up dark curtains in the bedrooms, but I just put on an eye-mask like the ones they give on airplanes and I sleep just fine. 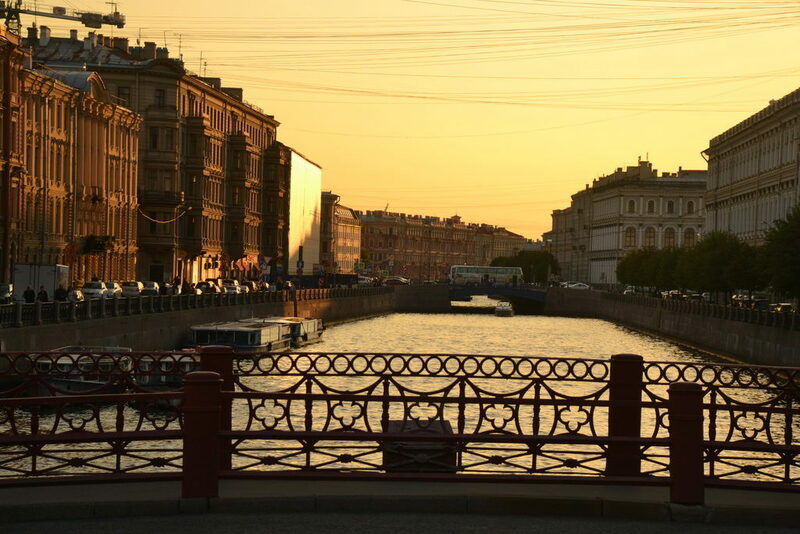 What do you generally remember from your stay in St. Petersburg? Has happened anything funny or interesting here to you? I have had so many funny encounters here I don’t think I could choose one. My life has definitely been interesting since I got here. Do you feel safe in Saint Petersburg? Absolutely – in the center, though. I have heard of strange people lurking around at night here, though, too, but I have never felt any less safe than anywhere else. I came to Russia with an open mind, so things weren’t really surprising or contradictory to my previous opinions. I know Saint Petersburg is different from the rest of Russia – that’s what all the locals tell me – but I have a feeling the difference is not that enormous, at least when it comes to people. I can’t wait to find out. P.S. Elektrichka is a commuter train.